Now that we've settled into the year a bit, I'm starting to see which kids are going to need more structured behavior plans during therapy time. So I've decided to incorporate a behavior chart during my session for those groups needing a bit more motivation. 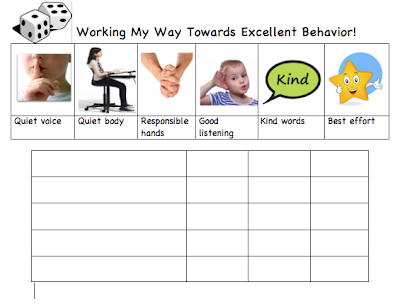 This behavior chart is meant to go along with my Speech Slides & Language Ladders reinforcement bulletin board, but break up the session time so the kids aren't just waiting the 15-30 minutes for one behavioral reinforcement. I laminated the chart so I can use Vis-A-Vis markers to write on it. At the start of each session, I write the names of each student in the left column. We review what they need to accomplish in order to earn their "chips" (bingo tokens). Each student must have three chips on the board by the end of the lesson in order to earn their roll in the reinforcement game. Although I try not to do too much negative reinforcement, I will take a token off the board if a student is not following the behavioral rules. I've had success with this new addition to my sessions so far. Try it out and let me know how it works for you! Grab your copy of the chart here.